My girls are young and I always worry it will happen to them or worse, they won’t tell anyone! Whether your child has experienced bullying or you’re just worried about the possibility, there’s a silver lining: psychological research supports the idea that teaching children good coping techniques can significantly decrease bullying — and if it does happen, your child won’t be as scarred by it. Here’s what you can do today to help your child deal with the possibility of bullying tomorrow. Bullying almost always involves a power imbalance, and it’s not just physical strength that matters. Finnish psychologist Christina Salmivalli notes in a 2010 paper that bullies tend to be perceived as powerful and popular. In addition, a study by a pair of German psychologists found that even elementary school-age children engage in bullying by social exclusion. Given the power imbalance, children who are bullied tend to withdraw. Natural though it may be, this kind of passive response may only bolster bullies’ perceptions of themselves as physically and socially superior. It turns out passive coping strategies actually tend to reinforce bullying. 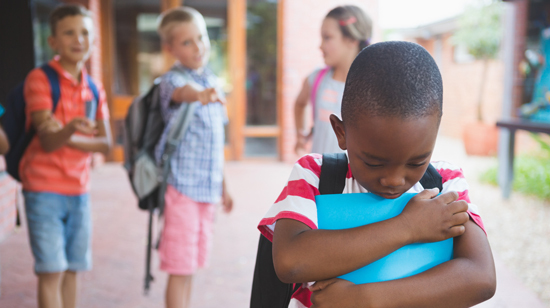 The most important skills to teach children in responding to bullying situations include remaining calm, saying “stop” assertively, and seeking adult help. Teaching kids to stick up for themselves can help them feel empowered in a frightening, power-imbalanced situation. Dealing with bullying can be extremely difficult for the victim. Getting through stressful situations like this requires what psychologists sometimes call emotional intelligence. Research has shown that building emotional intelligence helps children develop new coping strategies through emotional reasoning. Emotional reasoning is a critical skill in bullying and conflict situations because it helps children understand why bullies are acting out against them. It can therefore help them understand what is happening and see ways they might act to resolve the issue. Seeing that the bullying is not caused by anything that’s wrong with them, but by the bully’s emotions can help them see their way out. And good news for parents: It’s well established among educational psychologists that it is possible for students to learn emotional intelligence, including the skills needed to deal with bullying. People learn by observing models. In particular, they emulate those that they perceive to be good at dealing with what life throws at them. For children, these models are almost always parents (or other nurturing, trustworthy figures). But without examples of adults dealing with bullying, children are left not knowing what to do and often fall back on their natural response to simply try to avoid it. We can teach our children how to deal with bullying by providing them with positive examples. Not only should we not engage in bullying behavior ourselves, but we shouldn’t allow our kids to see us being bullied. The resources kids need to deal with bullying are learned through observation. By seeing their parents model anti-bullying strategies, children can gain the confidence they need to implement them on their own. Of course, no parent wants to be the parent of a bully. But there are times when even well-adjusted children might engage in bullying behavior. We can discourage these kinds of behaviors by urging children to consider things from another’s perspective — namely, the victim’s. It might seem like a challenging task, but psychological research on perspective-taking has shown that children as young as kindergarteners can develop increased awareness that others’ thoughts, knowledge, and feelings are different from their own. They have the ability to draw inferences about people’s intentions from their behaviors and past actions. As such, when we engage in perspective-taking (like teaching our children empathy), we can get children who might bully to understand how their actions harm the victim. Is your school leading the charge on the anti-bully brigade? That’s great news, but you’re not off the hook quite yet. Because schools often lack the infrastructure, staffing, and resources to effectively implement anti-bullying programs, the evidence on them is mixed. Many programs are designed as one-time interventions, and as a result, they don’t always take time to reinforce the skills they teach. However, there’s research to suggest that anti-bullying campaigns can have an impact if executed properly. The world isn’t perfect, and your school’s program might not be either. To complement an in-school anti-bullying program, you can teach resilience skills at home. That way, children can venture out into the world fully equipped with the kind of understandings and responses that will help protect themselves and others — including the bullies. Bullied people should learn to stand up and be strong to defend themselves with the help of their parents.